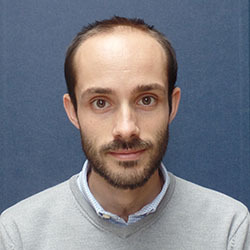 Victor Lefèvre is interested in highly-deformable heterogeneous materials and the wide range of mechanical and physical properties they exhibit. His research focuses on the development of analytical and computational tools aimed at describing and predicting the macroscopic multi-physics behavior of these materials from their microscopic characteristics. Thanks to their capability to undergo very large deformations in response to a wide range of external stimuli (including, for instance, mechanical, electric, magnetic, or chemical stimuli), these soft smart materials hold tremendous potential for practical uses in new high-end technologies in significant fields such as robotics and medicine. Lefèvre, V., Danas, K., Lopez-Pamies, O. 2017. A general result for the magnetoelastic response of isotropic suspensions of iron and ferrouid particles in rubber, with applications to spherical and cylindrical specimens. Journal of the Mechanics and Physics of Solids 107, 343--364. Lefèvre, V., Lopez-Pamies, O. 2017. Homogenization of elastic dielectric composites with rapidly oscillating passive and active source terms. SIAM Journal on Applied Mathematics 77, 1962--1988. Lefèvre, V., Lopez-Pamies, O. 2017. Nonlinear electroelastic deformations of dielectric elastomer composites: II -- Non-Gaussian elastic dielectrics. Journal of the Mechanics and Physics of Solids 99, 438--470. Lefèvre, V., Lopez-Pamies, O. 2017. Nonlinear electroelastic deformations of dielectric elastomer composites: I -- Ideal elastic dielectrics. Journal of the Mechanics and Physics of Solids 99, 409--437.